Hillsdale Business Association President Mike Roach says last year's flurry of snowstorms turned a solid sales year into a down year as coveted holiday revenue melted as quickly as a snowball roasting in a microwave. "You don't ever replace the sales," said Roach, who is also the owner of Paloma Clothing. "It's not like the three people who were going to come in during the three days it snowed came back as soon as the snow melted and bought exactly what they would have bought. That doesn't happen." So this year, Wardin Properties — which owns businesses in the Hillsdale business district along Capitol Highway, including Food Front Cooperative — has taken steps to ensure that the area is more well-kept and thus more appealing to customers during future snowstorms. Wardin Properties bought a Honda snowblower to help rapidly clear off snow, 23 shovels for tenants and non-skid strips for the walkway in front of Food Front and adjacent businesses. The snowblower is stored in the grocery store. "It's taking the bull by the horns. What can we do to make this problem better? Let's try it," Roach said. 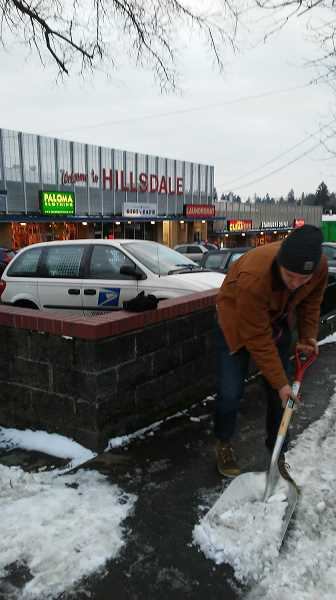 In March, some members of the Hillsdale Neighborhood Association implored local businesses to clear off their storefronts during future snowstorms and made the business association aware that businesses are not only responsible for the space immediately outside their storefront, but also for the sidewalk. Chris Braidwood-Reid, who is a member of the Wardin family that owns Wardin Properties, said he has reminded tenants of their responsibillities. "We're reminding them that we're all working together and everyone has to pitch in to take care of their space," Braidwood-Reid said. To ease the process, Wardin Properties purchased the shovels. "I wanted to encourage our tenants to take care of their area, and I thought that would be a nice, helpful gesture," Braidwood-Reid said. Roach said the shovels will empower businesses to make their storefront more attractive to customers during inclimate weather. "The reason I love what Chris is talking about is that it gives every owner a tool to take their own destiny into their control. If you can't get to the business to help shovel it, that's an issue. But once they get there, they have a tool to work with to help in front of their store," Roach said. Roach said the walkway in front of Food Front was dangerously slick last year and that the non-skid strips will help customers maintain balance in case of frosty conditions. "I remember shoveling the snow off the step and it was still slippery. It wasn't icy. It was a really odd thing where it was still slippery and it was dangerous," Roach said. Hillsdale Neighborhood Association member Adam Light grew up in Utah, where snow was the norm rather than a havoc-wreaking event. He said he has noticed thatnative Portlanders are generally much less equipped to deal with snow than those hailing from more brisk environments. "I didn't perceive that as a unique problem. I drove to the Alberta Rose Theatre (during a snowstorm last year). The streets were no more or less well kept there than here. This isn't a Hillsdale problem. This is a Portland problem," he said. Though he suspects that operating the snowblower might be challenging for some, he believes the machine could efficiently expunge snow along the sidewalks. "I don't know for sure that there isn't going to be some problem due to human error. But if they use it properly, it should enable them to clear the sidewalk along Beaverton-Hillsdale Highway pretty rapidly," Light said. At its November meeting, the Hillsdale Neighborhood Association reminded residents to band together shortly after snow hits and remove it as quickly from roads and sidewalks as possible. "If everyone took care of it, you would skip the part where everyone is sliding around," Light said. Roach doesn't believe the snowblower is an antidote to all snow-related ills, but he hopes it will make a difference. "We are hopeful that a snow blower used at the right time after it snows will be a whole lot better than it would be, but we'll see," Roach said.